Would guitar from ps3 work on ps4? brought this a while ago.....worst guitar hero game going...dont waste your money!! brought this a while ago.....worst guitar hero game going...dont waste … brought this a while ago.....worst guitar hero game going...dont waste your money!! Just ordered as I loved the old one on the xbox 360, why's it so bad? Moderators now consider it OK if a deal wasn't mentioned in a previous posts main title. The guitars are all identical but they connect to the consoles wirelessly via a USB receiver/dongle and those are platform specific. So if you bought the PS3 version you would be able to use the guitar from it with the PS4 version of the game but you would need to buy a PS4 USB receiver. I don't know where you would get one, though, apart from eBay, where they seem to be around £15, so maybe not cost effective. Puck? This is Guitar Hero, not hockey. price unquestionably hot, but i was very nonplussed by both the game and the controller on ps4 and haven't touched it since my initial week. 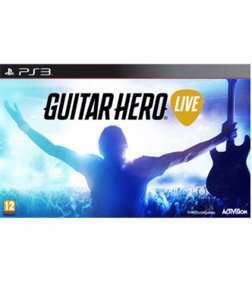 fans of guitar games may be better off with a ps3 5-button controller and frets on fire or another pc freeware version of the game with fan-created content. HEAT ADDED! Saw this in a Cash Generator for £19.99 preowned! Nice find! if you buy two, can you use both guitars in one game? Yes, but it's a bit rubbish. You just play the same track against each other, you can't take parts of the song between you. I guess if you like that sort of thing, yeah it works. Moderators now consider it OK if a deal wasn't mentioned in a previous … Moderators now consider it OK if a deal wasn't mentioned in a previous posts main title. And neither the 360, nor the PS3, nor this deal was mentioned in that post's title (so this is good to be highlighted separately).